Faith in God has extraordinary power because it helps us to open and accept eternal life. Ukrainians show courage: in difficult times, their actions show important values - faith in Heavenly Father and in freedom. This was emphasized by the Father and Head of the UGCC, His Beatitude Sviatoslav during his sermon on Sunday, August 12, during the Holy Dotmition Pilgrimage to Sloatsburg (USA), on Mount Mary. At the beginning of his sermon, the Primate noted that three jubilees coincided at that time: the 1030th anniversary of the Baptism of Kyivan Rus’- Ukraine, the 60th anniversary of the establishment of the Philadelphia Metropolitanate, and the rise of the Stamford Exarchate to the level of the Eparchy. In addition, the Head of the UGCC admitted that he was extremely pleased to stand at the same place where was Рatriarch Josуph Slipyi 50 years ago. His Beatitude Sviatoslav congratulated all those present on these outstanding events. Today, from the pages of Scripture, a question was asked to us: what shall I do to have eternal life? А rich young man asked Jesus Christ about this. That man was a person who was looking for his life, therefore he posed deep questions to the Lord: is there really eternal life and can it really be a treasure? "Eternal life is a gift and this gift is given to man in the person of Jesus Christ. He made a fundamental choice in front of a young boy: to choose eternal or temporary. The poor young man did not know what to answer, and therefore turned out to be frustrated. It seemed to him that what he now has in his hands is reliable ... However, the Word of God invites us to risk, because our real treasure is in heaven. Eternal life is more real than our personal earthly plans, hopes, illusions, or human deeds. Eternal life is faith in God, which we can discover in our hearts. Only by believing in God and accepting the gift of eternal life, we can be ourselves and collect the treasures that do not pass away," says the Head of the UGCC. According to him, eternal life can not be earned, but it can be accepted. Therefore, we should accept the Son of God as our greatest treasure, and He will give us eternal life. Then we will make sure that when we put the Lord and the Word of God in the first place in our lives, then everything in our lives will come to its place. "People are the greatest wealth of our Church," the Primate convinced. He added: "Now the Ukrainian people are blееding defending the independence of their state, they show the world that there are certain values ​​for which it is worthwhile to give their lives - this is faith in God and freedom," said the Head of the UGCC. In his opinion, we came into this life without anything and will leave it empty-handed, and our treasure will be what we picked up during our earthly life. "Today, I want to give our Church in the USA under the Protection of the Blessed Virgin Mary! Pray that the new waves of our people who arrive оn this continent do not dissolve into the great sea and not lose their greatest treasure - faith in God ... Let our Church, through your prayers, receive a new impetus to life in this country, and our Ukrainian people could say: "Ukraine was, is and will be, because God is with us!" 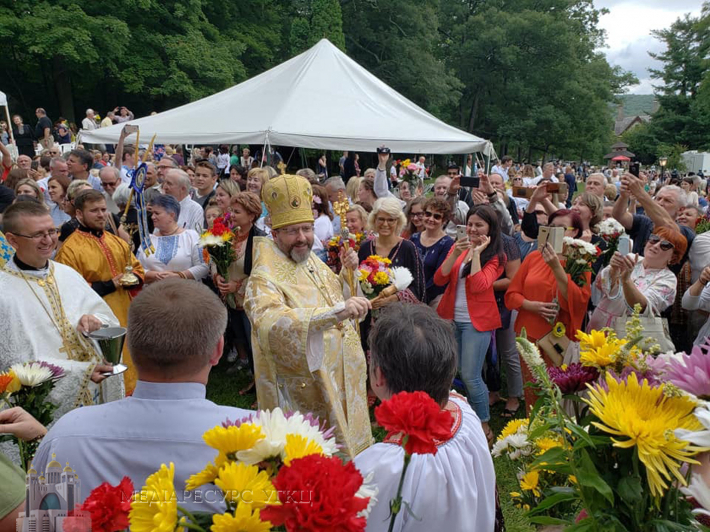 - added at the end His Beatitude Sviatoslav, and also thanked everyone for the presence and for their love of the Almighty and the Church.